Decipher Tools > Blog > App Store keeps asking for your password on iOS 9? Is the App Store or iTunes Store app on your iPhone repeatedly prompting your for your Apple ID and password? I mean repeatedly as in, you enter it, the iPhone thinks a moment, and then asks you again, never satisfied. In iOS 8, the solution to this was pretty easy: You could sign out of your account in "App and iTunes Stores", reboot, and sign back in no problem. Starting in iOS 9, a few more settings share the same configuration file that the store apps use, making the solution a little more involved. Next, we sign out of iCloud because it seems to be needed too. Settings → iCloud → Scroll to bottom → Sign Out. Here you will be prompted about whether you want to keep or delete iCloud synced data. I choose to delete the iCloud synced stuff from my iPhone, since it will come back when I sign back in. Do whatever you are comfortable with. Wait for the iPhone to reboot. Raise your eyebrows at the barrage of iMessages after the phone reboots if you get them... Now sign back into things. Settings → Wi-Fi → Sign back into your wifi. This is critical if you don't have cell service, but nice either way. I forgot my Apple store password . How can I check it back? I forgot my Apple store password. How can I check the same? I had the same issue where my iPad wanted a password with every free app download, including manual updates. After reading this article and groaning a bit in pain, I decided to Settings > General > Reset > Reset All Settings in a Fix-All effort. This worked. I did not have to sign out manually of iCloud anywhere; I just had to enter my iTunes password once when I logged in, and now I can download free apps and updates quickly with no pw. This issue did seem to arise, for me, from attempting enabling restrictions. I was trying to disable apps so I could use a web version of an app. This was a bad idea, because it auto sorted all my apps on my home screen a-z when I turned it off, and seemed to introduce this free-app download password request issue. I also did attempt enabling restrictions again (Although I only tried disabling installing apps) after the reset, and the password issue did not re-appear. The downside is I have to update all my iOS settings, as they are now defaults. For one, I had to upgrade my notes to iOS 9+ standards; apparently this is required now. Also, for some reason iOS seems faster and more responsive overall after the update. This could reflect some background apps not yet functioning or a better optimization from the latest iOS changes. I had been having this problem during the last months on my daughter's iPhone, very frustrating. This procedure fixed it! The device is on iOS 10.2. It is worth mentioning that there are 2 other places where you will find your Apple ID signed in: The Messages and FaceTime settings but I didn't touch those. Maybe they do not share the same database file as described in the article. Hi Thorz - Thanks for commenting to let us know this worked for you on 10.2! Hi! If you read my edited answer you will see that the problem came back after trying to activate restrictions. It is a bug and I have reported it. Drat! I will see if I can replicate the problem coming back after turning on Restrictions and if I have any tricks to try! My iPhone is jailbroke, will resetting the phone wipe my jailbreak? Will I have to reinstall jailbreak app? My honest answer is "I'm not sure" since I don't work with iOS 9 jailbreak a lot. But, I think it depends on the iOS version jailbreak you're on. https://www.reddit.com/r/ja... This reddit post makes it sounds like you can reset settings (not content), but I would do a search about your specific jailbreak version to make sure. The iSheep way of doing things which every apple fanboy eill be proud of. iSheep or no, after trying other suggestions from other sites, this is the only one that worked for me, so I'll take it! No, don't erase your settings! I had this issue in iOS 8 and then it popped back up in iOS 9 and finally figured it out. 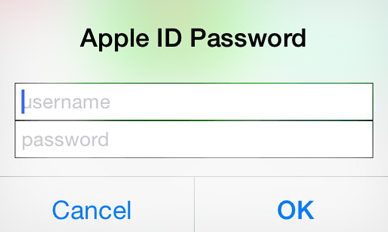 In Settings → App and iTunes Stores, there should be a subscreen under your Apple ID for Password Settings. I looked but couldn't find it. I read that if you have Touch ID active, it will be hidden. Problem is that I have an iPhone 5 WITHOUT Touch ID. I *do*, however, have Restrictions turned on to prevent in-app purchases. Apparently, the Password Settings is ALSO hidden if Restrictions is turned on. I went there and found that the neither option was selected and that Require Password for free downloads was turned on. So the solution that worked for me was to go to Settings → General → Restrictions → Password Settings, select a password timeout setting, and turn OFF the Require Password for free downloads. Looked for this trail and didn't find it, but I *did* find Settings --> General --> Background App Refresh. All apps are listed here. Most of mine already had the setting to be "on" but maybe a half-dozen were "off." I turned them on, we'll see what happens in a couple days.